Few tourists who arrive in Lamu have much of a grasp of Swahili. There are two phrases that you’ll hear so often within your first day on the island that they’ll be firmly embedded in your brain: “hakuna matata” (no problem) is already an international catchphrase courtesy of The Lion King; and “karibu”, the sing-song Swahili welcome that you hear everywhere on Kenya’s little Indian Ocean paradise. This small island just off the mainland of Kenya is renowned as the most authentic Swahili settlement in East Africa. Even today there are virtually no vehicles: two ambulances, two tractors and a car owned by the District Commissioner are the only alternative to donkey transport. Without donkeys Lamu would come to a standstill and as you walk down the cobbled Main Street or along the waterfront you meet whole caravans of donkeys burdened with vegetables, sand, cement blocks… ‘Off-duty’ donkeys wander through the crowds outside the old fruit market, browsing for trimmings. If recent press reports are to be believed, Lamu is the axis of terror. A land of kidnappings, piracy and general mayhem. Surrounded by smiling faces and welcoming comments you’ll find it hard to believe though. You stroll the narrow alleys of the medina late at night with absolute security. Street crime is virtually non-existent in a tiny town where everyone knows each other and there is an unwritten code that travellers should be welcomed. But events during the last year have rocked the sleepy little town to its core. In September 2011 a British tourist was shot and killed. His wife was abducted and spent seven months in captivity before being released. A month after that attack a French woman was kidnapped and finally murdered by Somali bandits/pirates. This sort of report travels fast and spreads widely. We’d been commissioned to update a Fodor’s guidebook on Kenya, so were convinced that one way or another we had to check out the current situation on Lamu for ourselves. By the time we arrived in Lamu, it seemed already that the reign of terror of the Somali pirates (at least in the far south) was coming to an end. News reports rarely capture the real atmosphere of the man in the street and sometimes there is really no substitute for seeing for yourself. While security is tight now in Lamu, the ancient neighbourhood security of old days remains the most effective of all: a strange face in the streets is noticed quickly; suspicious behaviour doesn’t go unreported these days. The underlying feeling is not one of tension and caution however. It’s a relaxed, smiling Indian Ocean welcome. 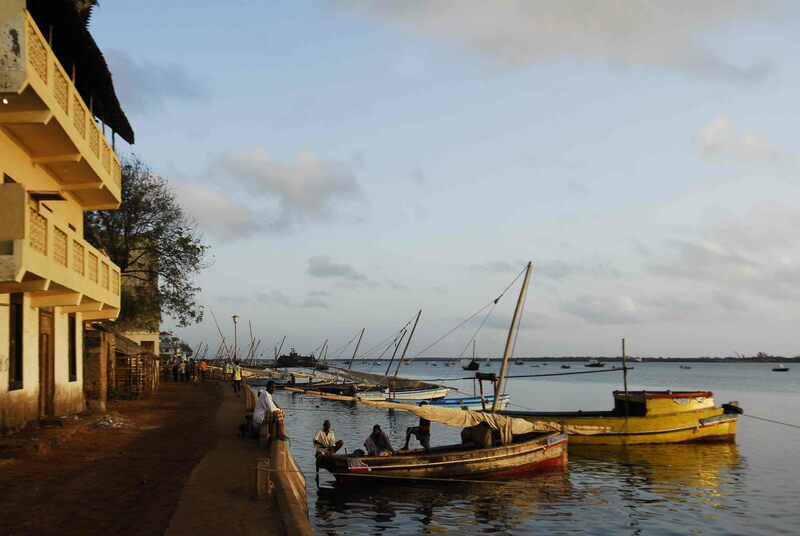 For more than a thousand years Lamu has been greeting and trading with visitors – African, Omani, Yemeni, Indian, Portuguese, British… Today the people of this ancient cultural heritage seem to be more anxious than ever to welcome travellers back. Lamu is reverting to the same trouble free paradise it always used to be. But don’t just take my word for it. Go and see for yourself. Mark recently spent a month travelling Kenya, working on a guidebook update and researching for various magazine commissions. Read more posts on Kenya here. Next articleNew species found in Kenya? Beautiful words on this little town. I’ve never been to any African country, I’m almost afraid to begin exploring the continent as it’s so overwhelmingly big I wouldn’t know which country I should start with. I’ve been thinking about Kenya, Mali, Burkina Faso, probably next year I’ll make the move..